Flexible endoscopes (long, slender, flexible instruments with a camera and light at the distal end, having working channels to introduce flexible instruments) are used for diagnostic and therapeutic interventions inside the human digestive system and inside the abdomen. Though used for their flexibility, the flexibility of these instruments causes several difficulties during insertion and use. 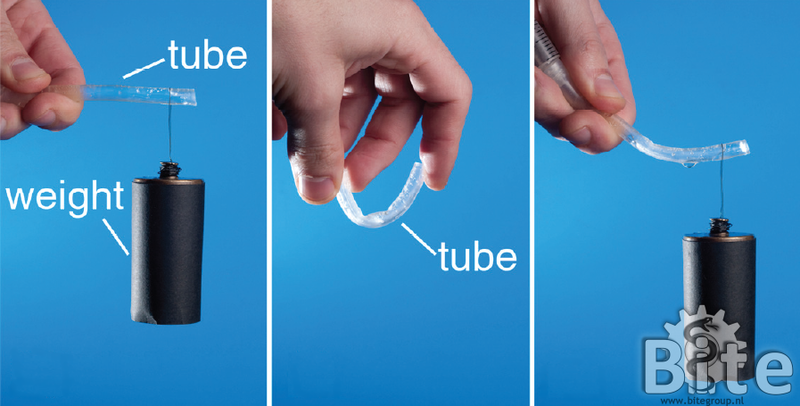 During insertion, flexible endoscopes can buckle and loop, which may hamper full insertion into the patient’s body. During therapeutic interventions, the flexible endoscope fails to provide stability for surgical instruments that are introduced through the flexible endoscope. The FORGUIDE mechanism enables making a shaft-guide out of cheap standard parts that is rigidified by creating a laminate that consists of a spring, cables and expandable tube. The connection between these three layers is obtained by friction. 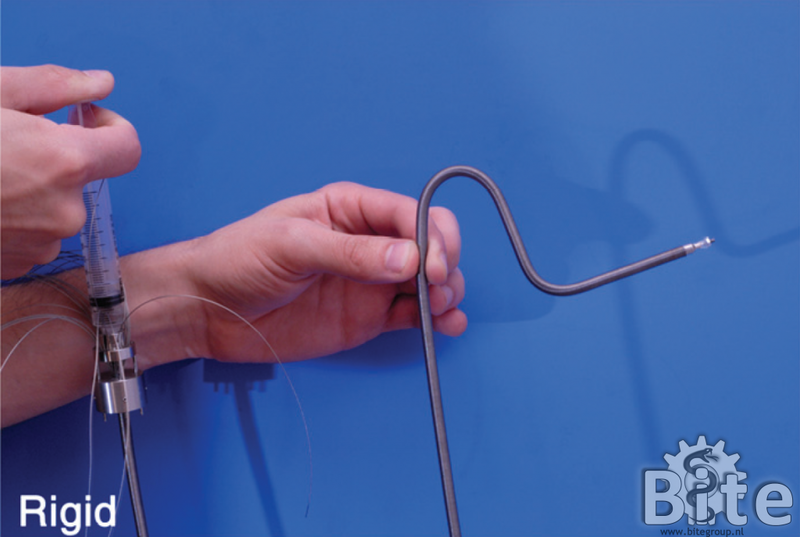 The bench tests showed that the FORGUIDE prototype FGP-01 of only 5.5 mm diameter could provide flexural rigidities up to 1541 Ncm2 , which far exceeds the flexural rigidity of flexible endoscopes. Furthermore, a bending radius of almost 1 cm could be achieved in the compliant state with the FGP-01 without losing the ability to rigidify. Loeve, A. J., Plettenburg, D. H., Breedveld, P., & Dankelman, J. (2012). Endoscope Shaft-Rigidity Control Mechanism:“FORGUIDE”. Biomedical Engineering, IEEE Transactions on, 59(2), 542-551. Flexible endoscopes are used for diagnostic and therapeutic interventions in the human body for their ability to be advanced through tortuous trajectories. However, this very same property causes difficulties as well. For example, during surgery a rigid shaft would be more beneficial since it provides more stability and allows for better surgical accuracy. In order to keep the flexibility and obtain rigidity when needed, a shaft guide with controllable rigidity could be used. On this page we introduce the PlastoLock shaft-guide concept, which uses thermoplastics (Purasorb PLC 7015) that are reversibly switched from rigid to compliant by changing their temperature from 5 to 43 degrees Celcius. These materials were used to make a shaft that can be rendered flexible to follow the flexible endoscope and rigid to guide it. A feasibility study shows the great potential of this concept in terms of achievable flexural rigidity, miniaturization, and simplicity. Loeve, A. J., Bosma, J. H., Breedveld, P., Dodou, D., & Dankelman, J. (2010). 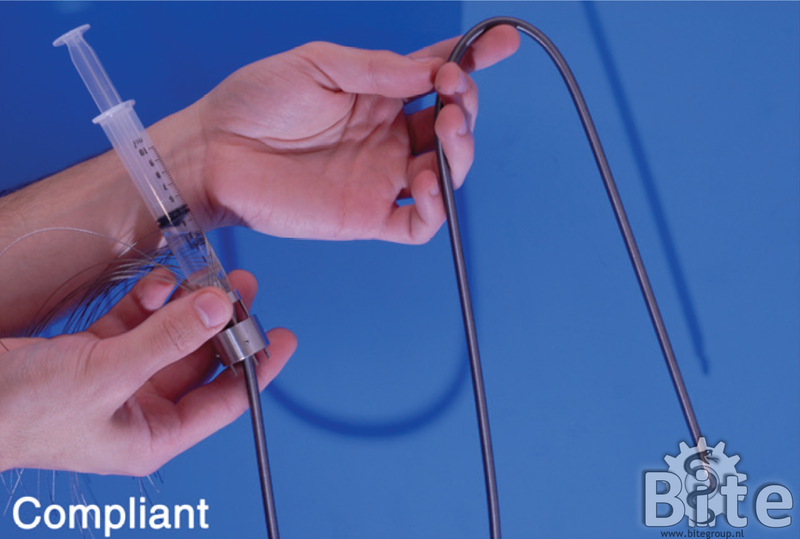 Polymer rigidity control for endoscopic shaft-guide ‘Plastolock’—a feasibility study. Journal of Medical Devices, 4(4), 045001. In order to fully benefit from the functionalities of flexible endoscopes in surgery, a simple shaft-guide that can be used to support the flexible endoscope shaft is required. Such a shaft-guide must be flexible during insertion into the human body and rigidified when properly positioned to support the flexible endoscope shaft. A shaft-guide called ‘Vacu-SL’ was designed. The Vacu-SL rigidity control mechanism utilizes the flexural rigidity increase that is achieved by vacuuming foil tubes filled with small particles. In this prototype the influence of particle hardness, size, and shape on the flexural rigidity of vacuumed foil tubes filled with these particles is investigated. Experiments show that the flexural rigidity increases with the hardness and irregularity of the particles and that there may be an optimal particle size in the low particle diameter region. Loeve, A. J., van de Ven, O. S., Vogel, J. G., Breedveld, P., & Dankelman, J. (2010). Vacuum packed particles as flexible endoscope guides with controllable rigidity. Granular matter, 12(6), 543-554.